Planning for a trip to India often begins months in advance. But once we are there in India regardless of being a returning expatriate or a tourist, it is a rushed and often haphazard affair shopping for gifts for family and friends in the USA. 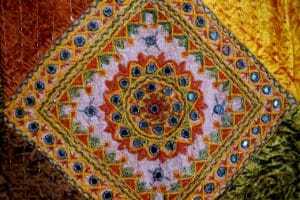 India is famous for handicrafts and handloom goods, the varieties are dazzling. But there is only limited baggage allowance that your gifts which have to share space with your own personal belongings. If you happen to be like my husband who gets very confused while buying gifts, here are some ideas that are sure to please. Hand loomed colorful and beautiful scarves and sarees that are either silk or cotton. Jewelry shopping is a must for the women in your life. Unique locally designed earrings or bracelets will be a hit while at the same time being light and easy to carry. Perfume oils to fragrance for the bodies and hair with choice of floral or spicy scents like cinnamon or healing scents like sandalwood. Handicraft wall hangings, small picture frames or miniatures to beautify the home. If you are traveling to southern India then don’t forget to bring back small sandalwood curios such as idols, incense or any small mementos. India is one of the great civilizations on the Silk Road and famous for spices like cardamom, cloves, cinnamon, nutmeg and saffron. Buy a good variety and assemble your own gift boxes with mixtures of different kinds of spices for your foodie friends and colleagues. As we’ve read in Agatha Christie mysteries, we are reminded of classic Indian teas. So pick up your Darjeeling, Assam and Nilgiri Hills tea from the source. Sweet alert! India is famous for many kinds of sweet delicacies with different regions using unique kinds of ingredients. Many are flavored with almonds, pistachios and spiced with decorated with nuts, gold or silver leaf. You can bring boxes of sweets, vacuum packed, for your eager neighbors and friends to satisfy their sweet tooth. Cook books for a home chef are a great way to learn how to utilize the wonderful spices! Musical instruments from Mumbai, a sitar (string instrument), table set (drums) or harmonium. Pack these fabulous gifts carefully, check out our tips how to pack your luggage. To both ease your shopping budget and be a god send to a senior or family on your flight, sign up as a trip companion!